MSD Billet Ford V8 distributor is a popular route for people looking for race proven performance for street or race cars. The adjustable MSD mechanical advance set up gives you the opportunity to dial-in your required timing curve via the kit of springs and stop bushes. The housing of the Pro-Billet features a CNC machined aluminium design for accuracy to within 1/1000”. The steel shaft is tuftride coated for endurance and low friction and rides in a sealed ball bearing at the base of the distributor for accurate spark delivery at any rpm. The Billet Ford V8 relies on a magnetic pickup to trigger an MSD ignition control (purchased separately) that delivers the powerful sparks to the coil. This pick up is extremely accurate and never needs adjustment. For maximum protection against crossfire, the distributor is equipped with a large cap with “spark-plug” type terminals for secure wire attachment. Designed for Small Block Ford 351W. 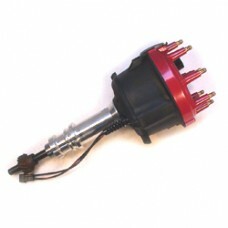 Must be used with MSD Ignition Control e.g. MSD6200 or MSD6420 and MSD8202 coil.